Following a highly successful 2017, leading Suffolk law firm, Greene & Greene has had a prolific start to its 125th Anniversary Year. The firm’s specialist corporate team has been particularly busy, advising clients on a number of high-value acquisitions in various market sectors. · Working on behalf of international group Berlin Packaging on its acquisition of Hadleigh based packaging supplier, H. Erben Group. Berlin Packaging is a $2.6 billion global supplier of rigid packaging products and services to customers of all types across all sectors. Family business, H. Erben Group, supplies closure, packaging and packaging equipment and has dedicated operations in South Africa, the US and in the UK. It generated revenues of over £30million in 2017. Together, the combined company will have considerable geographical coverage throughout the world. · Advising the shareholders of Suffolk based, Box-it East Limited, on the sale to the Oasis Group, the fastest growing records and information management company in Europe. · Acted on behalf of the shareholders of i4 innovation Ltd and its group of companies, a multi-disciplined design and manufacturing company providing services to customers in diverse industries, including Biotechnology, Medical Devices, Education, IT and retail on its acquisition by the Heathpatch group. This latest acquisition will complement Heathpatch’s subsidiary company, Camden Boss, which designs, engineers, manufactures and distributes an extensive range of innovative electro-mechanical components, electronic housings and cabinet solutions. · Acted for Evogreen Limited, a supplier of sustainable energy solutions to educational establishments, local authorities and commercial businesses across the UK, on an investment by Downing, a London based investment manager. · Guided Nexus Group on its most recent acquisition of “Fast-Growing” Aspley Specialty - a Directors & Officers and Financial Institutions (DOFI) MGA. Nexus has established a strong position in the DOFI market with a wide range of market-leading proprietary products and has a particular specialty in the middle market investment funds sector. 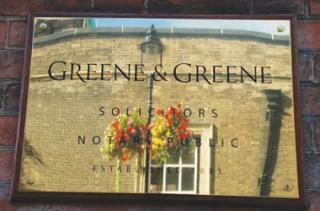 Greene & Greene’s involvement in this latest transaction follows on from its lead role in advising Nexus on its purchase of various businesses since 2011.